King Aluminum Gas Shocks: Arctic Cat is the only OEM that offers King single-speed adjustable aluminum gas shocks, which are exclusive on the Wildcat Sport SE model. 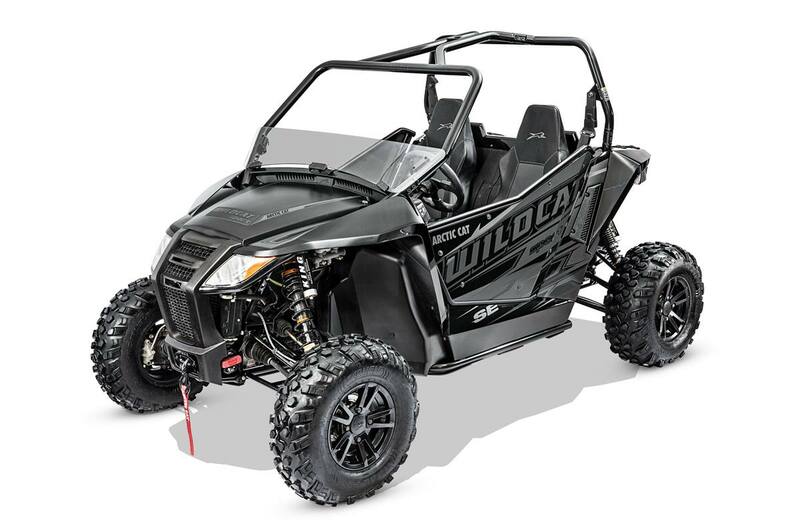 That makes this mid-sized machine the ultimate sport machine to tackle almost any terrain. The double a-arms front and rear give you 12.2 inches of suspension travel up front and 12.6 inches in the rear. WARN® 3,000-lb. Synthetic Rope Winch: Exclusive to the Wildcat SE models, this 3,000-lb. WARN winch includes 50' of market-leading 7/32" Spydura™ synthetic rope. Powerful permanent magnet motor with 3,000 lbs. of pulling capacity. All-metal gear end housing and mechanical brake. Carlisle Trail Pro Tires with Black Aluminum Wheels: The Trail Pro 4-ply tire is designed exclusively for the Wildcat Trail and Sport. Light, strong and performance hungry. The custom black aluminum wheels give this combo a solid one-two punch. 2/4 + Electric Front Differential Lock: Arctic riders prefer to be in control with their on-the-fly 2WD/4WD. Tackle more rugged terrain by locking the front differential with the flip of a switch.